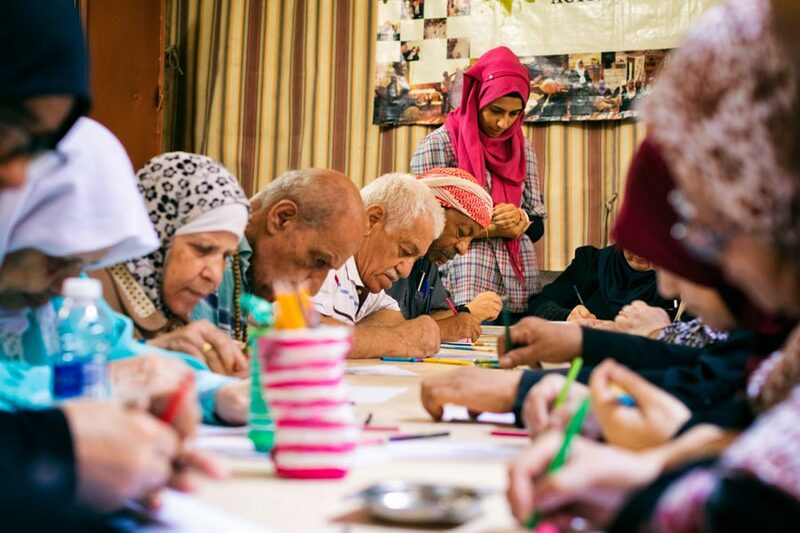 Established in 2006, the Active Ageing House has served as a second home, support center, and vibrant hub of cultural and recreational activities that have transformed the lives of seniors in Burj Al-Barajneh camp. In 2008, a second center in Nahr Al-Bared camp opened its doors to refugees with the same purpose, values, and quality of service; and now in 2018 we are in the process of opening a new center in Shatila Camp. The Active Ageing House hosts regular arts and crafts sessions. Activities include puppet theater, crocheting, knitting, flower arrangement, carpentry, working with clay and portrait drawing. The importance of such activities lies not only in relieving stress and adding color to the lives of the seniors, but also in stimulating them, physically and mentally. One activity that stands out is our traditional doll-making craft that takes seniors back to their childhoods in Palestine. The Active Ageing House project is based on the need of seniors to learn new skills, connect and engage with younger generations, and their ability to contribute to the growth and wellbeing of their community. The project also organizes activities that are recreational and stress-relieving while at the same time ensuring that seniors remain active, both physically and mentally. Painting, drawing, pottery, making flowers and dolls, traditional Palestinian needlework and knitting. Aims to bridge the gap across generations by regular visits to our centers by children in collaboration with other NGOs in the camps. The elderly, who had never had a chance to attend school, learn how to read and write in a simple and motivating manner. They also engage in basic computer literacy classes which help them connect with the world of today and communicate with their families around the world. The elderly enjoy regular sports sessions at a club nearby and participation in the Beirut Marathon is offered. Visiting doctors from Medecins Sans Frontiers provide regular checkups. We participate in the Diabetes and Blood Pressure Awareness campaign that includes monthly follow ups on how to live a healthier life. Our elderly participate in the preparation of weddings held at our partner organization, Unite Lebanon Youth Project‘s campus to ensure everything is done according to Palestinian traditions. During the Holy month of Ramadan a competition involving Ramadan related questions takes place with winners receiving prizes. Mother’s Day, Grandparents Day, Land Day and Nakba are some of the commemorations and celebrations our elderly participate in. Once a month, the members of the Active Ageing House go outside the center and visit different areas in Lebanon. They enjoy cultural and recreational trips as well as picnics. The favorite trip is the annual visit to the closest point to the border with Palestine. Every Wednesday the elderly cook together. A monthly competition is held where everyone taking part cooks the same dish and a visiting chef selects the winner. Our donors annually cover the cost of Haj and Omra for tens of elderly. We cater food to other NGOs as well as friends of Social Support Society. Our stand at the food market “Souk el Tayyeb” has become a popular destination.